Planning a summer wedding? Whether your wedding is outdoors, at the beach, or inside, summertime is a magical time for weddings. We are here to help you with the 5 tips for a beautiful summer wedding! 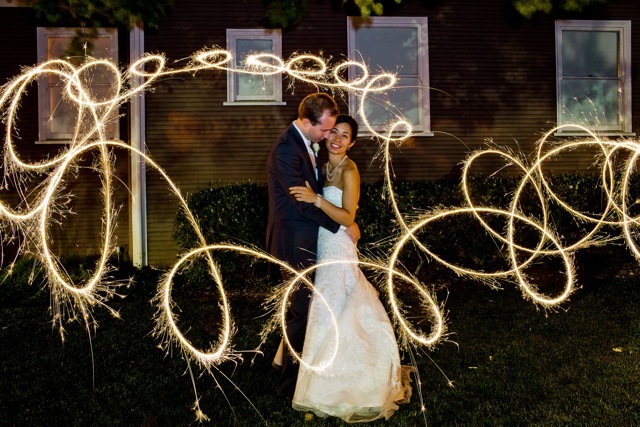 A very popular trend right now, wedding sparklers are taking the wedding circuit by storm. Sparklers for weddings are great additions for your guests to interact and celebrate your special day! Sparklers can be used for decoration during the reception and grand send-offs. Account for all your guests and have enough sparklers on hand! Have them lit and ready when you leave as a married couple. Summer nights, sparklers lit, it’s the perfect combination. The photos will make for an unforgettable memory. Summer weddings are great..minus the summer heat! If your ceremony or reception is held outdoors, take the proper precautions to ensure your guests are cool and comfortable. Rent fans or provide shade for your guests. Keeping cool is very important! Set-up “hydration stations” with water or fruit infused water to make sure everybody is enjoying themselves! Having a summer wedding leaves room for lots of creativity. Look at Pinterest for summer cocktail recipes! Your guests will love to sip on a refreshing summer inspired cocktail while dancing and celebrating your special day. Pinterest recipes can be made non-alcoholic as well! That way, all of your guests can enjoy the refreshing taste of summer! As we’ve mentioned, the summer heat can be sweltering! Depending where you plan to have your wedding and reception, plan for an evening wedding. If your wedding is in the evening, you will be wed as the sun sets and your reception will take place at night! Bonus, it will still be warm in the summer night and allow for your guests to dance the night away. Create your menu based off summer inspired cuisine! Summer weddings give you the opportunity to grill out, serve chilled foods and other selections. Keep the menu light and fun! Serve shrimp cocktails, fresh fruit or small sandwiches. If you want to do a picnic or grill theme, serve hot dogs, hamburgers, french fries, watermelon, chicken wings, popsicles etc. Depending on your theme, summer offers a wide variety of options for refreshing food options. Now it’s time to start planning a beautiful summer wedding! Use our 5 tips to make it the celebration of a lifetime!